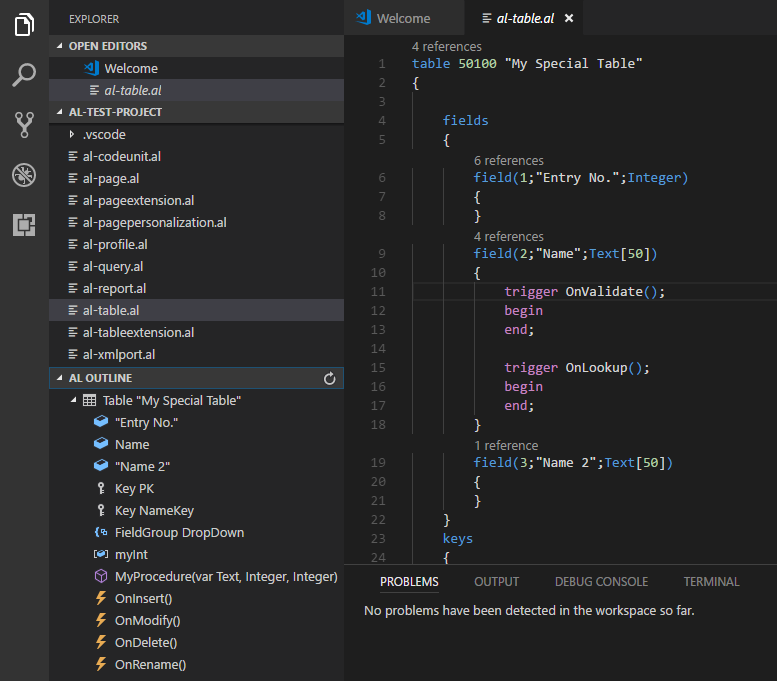 Visual Studio Code>Other>AL Code OutlineNew to Visual Studio Code? Get it now. For AL file types, extension tries to extract a bit more information from the language server and can display context menu with additional options for some of the symbols. At this moment, context menu allows user to run pages, reports and tables in the web client and to create new card and list pages, reports, xmlports and queries with all fields from selected table symbols. It is also possible to view symbols from symbol reference packages. Extension adds a new "Open in AL Object Browser" entry to explorer contect menu for *.app files. It opens a view that looks similar to c/al object designer. Selecting object entry in this view updates code outline view. It can also display context menu with options to show object definition and run table based object generators. Right click on object list column header opens another context menu (added by rvanbekkum), which allows to apply filter to the list. It is also possible to select multiple rows in AL Object Browser by clicking on the lines with Ctrl or Shift keys pressed or by pressing Ctrl+A (another great rvanbekkum contribution). When multiple rows are selected, object generators will generate new files for all of them. This extension has been inspired by "Code Outline" extension created by Patryk Zawadzki and "Tree Data Provider" example from "VS Code Extension Examples". I've decided to create it because I wanted something that could understand AL object structure and to be able to add some AL specific commands to tree nodes in the future. alOutline.promptForObjectId: when generating a new object, ask the user to input the object ID. 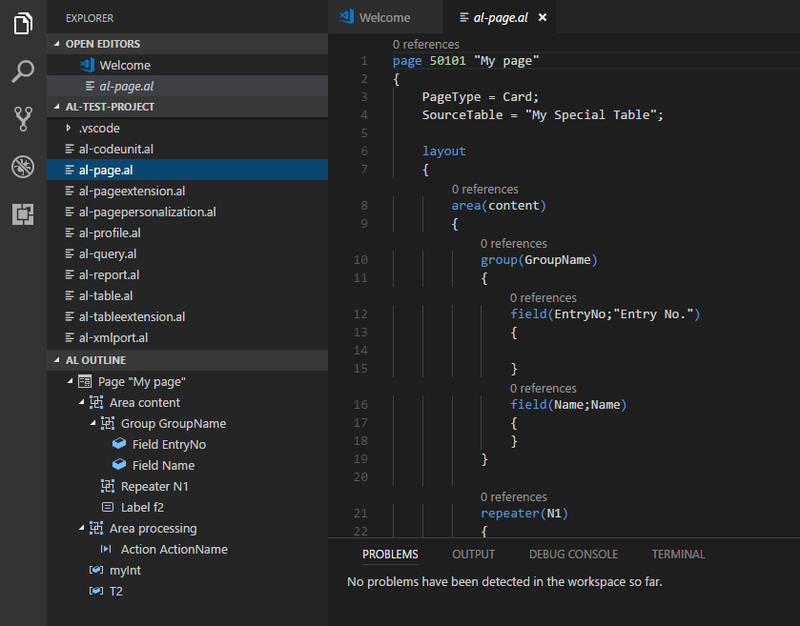 When AL project is opened in Visual Studio Code, AL Code Outline pane might not be visible or might be empty even if one of *.al files is opened. You have to switch to another al file to display/refresh it. It takes some time to parse all *.al files when new project is opened so code outline will stay empty during that time. You can use Refresh button to force it to reload content. Extension uses CRS-AL-LANGUAGE-EXTENSION for generating file names for new objects. As a result you will see plenty of new snippets added by the CRS extension. If you don't want to see them, go to Visual Studio settings and disable them in CRS-AL-LANGUAGE-EXTENSION section.